Cardiff City Football Club has successfully staved off a winding-up petition in the High Court. The Registrar dismissed petitions against the club after being told that debts to Her Majesty's Revenue and Customs had been paid. The petition came because of a delay in paying a £1.3m PAYE bill to HMRC. The club has been under a transfer embargo for the majority of the summer due to their failure to pay the taxman, a ban that was lifted last week. 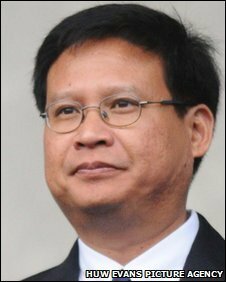 New chairman Dato Chan Tien Ghee has reassured Cardiff fans that the club's new Malaysian investors have no plans to sell the Championship club. Bluebirds boss Dave Jones said Chan has told the players his consortium are "in it for the long haul" as they deal with Cardiff's estimated £30m debt. "All the speculation that he is going sell it and everything else," he said. "He reiterated he was in it for the long haul. They have put a lot of money in and wants to get it right." A Malaysian consortium - backed by billionaire property magnate Tan Sri Vincent Tan Chee Yioun - has already invested £6m to help stabilise the debt-ridden Welsh club since taking over from Peter Ridsdale as major shareholder in May. The new investors, who accrued approximately 30% of Cardiff shares, dealt with a High Court winding-up order after settling a £1.9m tax bill to HMRC. But another petition over the latest £1.3m PAYE bill followed and new chief executive Gethin Jenkins has warned that a third transfer embargo is a possibility. Eight Cardiff stars including Peter Whittingham, Jay Bothroyd and Stephen McPhail are out of contract next summer and are beginning negotiations on new deals to extend their stay at Cardiff City Stadium. Winger Whittingham, last season's Championship top-scorer, is wanted by Nottingham Forest and their chief executive Mark Arthur claimed the former England Under-21 had rejected a new deal at Cardiff and wanted to join Forest. But manager Jones hopes Chan's long-term pledge ends the uncertainty and has urged players like Whittingham and Bothroyd to also commit long-term to Cardiff. Chan, the man known as 'TG', spoke to Cardiff's players before their opening Championship 1-1 draw with Sheffield United to assure them of his commitment. Jones revealed: "I don't know what I said to him on Saturday but he must have been fed up of seeing me as I was with him for hours and hours so TG saw the players before kick-off. "He is in it for the long haul and that can settle everybody down so I can start to do what I want to do and get new players in. "Every player here, whether they are out of contract or not next season, wanted to know what was going on like me and TG has cleared that up. We're all in it together now." And Jones hopes Chan's comments help persuade Whittingham, who has been subject of bids from Championship rivals Forest and Burnley this summer, to sign a new three-year deal at Cardiff. "What Whitts wants is assurances about what is going on here," said Jones. "That we're going to bring players in, that we're going to build, that we're going to move forward. Questions about whether am I staying? Are the staff staying? "But they have all been answered. Hopefully we can kick on with negotiations." Cardiff suffered Wembley heartbreak at the end of last season as their Premier League promotion bid fell at the final hurdle with a 3-2 Championship play-off final defeat to Blackpool. But Chan has assured disgruntled fans and players that investment in Jones' threadbare squad will be made as Cardiff bid to make it third time lucky in their top-flight bid. Star striker Michael Chopra publicly aired his frustrations about the uncertainty at Cardiff before the embargo as lifted when he told a local newspaper: "I'm well hacked off. "If this club does not bring in new players, I'm off. I've had a enough of this." But Cardiff's players appreciated Chan's appearance in the dressing room to reassure them of the new investors' long-term commitment. "It is great he came to the first game," said club captain Mark Hudson. "To tell us that players are coming through the door is going to be good for us. It gives you bit a bit of belief. "As long as we can add to the competition, the bigger the squad the better."